Bauxite is converted to alumina using the Bayer process. 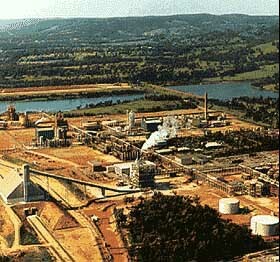 Bauxite is combined with caustic soda, lime, and steam to produce a sodium aluminate liquor. Impurities are filtered or settled out of the liquor and alumina hydrate is precipitated out of the mixture. The alumina hydrate is calcined to remove moisture and drive off the bonded water. The resulting alumina is ready for smelting into aluminum.